(Newser) – The West African country of Mali claims four UNESCO World Heritage Sites, and as of Wednesday, three of them were on the List of World Heritage in Danger—which runs only 54 items long. 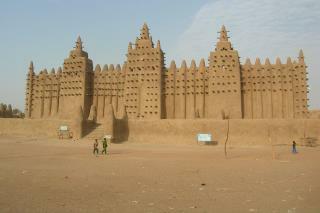 The Old Towns of Djenné and its 2,000 mud houses, which have been inhabited since the third century BC and a World Heritage site since 1988, joined the list due to "insecurity" in the region, according to a press release. Islamist militant groups have plagued Mali, Time reports, and there were political clashes in the north as recently as this week. Reuters reports troops fired at protesters in the city of Gao, whose Tomb of Askia is also an endangered World Heritage Site (as is the ancient Malian city of Timbuktu). People living there are thinking "Uh oh. My name is mud". I'm sure that these radical Islamic terrorists would look at destroying the Mormon temple in Utah, as a big trophy....This is a possible future if hillary is elected, remember that crooked liar builds her voting base by giving away the US to foreign immigrants to continue building her corrupt party's voting base at our expense.